When I moved from Bogota (Colombia) to Paris I did a degree in translation and found myself, years later, working for one of the most important publishers specializing in research. But my dream since I left Colombia was to study Psychology. After about two years, I quit my job and went back to college. It was not an easy decision, but it never is, is it? My interest in starting this new career was to work in Clinical Psychology and Psychopathology. However, as far as I continued with my degree, I was finding subjects that put in doubt what I really wanted to work in the future. Health and Occupational Psychology was one of them. At that time I was still living in Paris with my husband, Andrés Cifuentes, a chemical engineer who ended up doing a master’s degree in web programming. Afterwards he became a WordPress enthusiast and nowadays he works within the WordPress ecosystem. Back then, while he spent his free time getting to know and learn more about WordPress (I didn’t know at that time that I was discovering WordPress too!) he listened to different podcasts and many of them addressed issues of the problems that remote workers had to face. All of these people in the podcasts mentioned burnout as a result of their work and what they suffered for it. It was at that moment that I made the connection; I had found what I wanted to do. The same day I started to investigate more about remote work and its impact on stress and burnout on the web (blogs, articles, essays). When time came to start my master I presented my project to my thesis director: I wanted to establish a relationship between remote work and burnout. Although he accepted my first subject of study, there was a long path waiting before establishing and defining my research area. Getting into the first steps of the research, I started an arduous research work of the literature review on remote work, which turned out being quite frustrating, as I could not find any scientific paper for my study on the subject. The only helpful information I could find was the research that had been done on telework, which was the closest type to remote work although it was not good enough. On the other hand, as a requirement for the master, I had to find an internship in a company, so I spent hours and hours writing cover letters and applying to boring internship offers which practically wanted the interns to make coffee. Nice! Fortunately, my husband had the wonderful idea for me to apply to companies working with WordPress. Since those companies are mostly 100% remote, this would help with my research along with having personal experience on remote work myself. Lucky me! I had the great opportunity to do my internship in Human Made. My proposal was to do a psychosocial risk assessment in the company that would also serve for my study. They were very kind to me and welcomed me warmly. No doubt they are a great company, Tom Wilmot truly cares for the wellbeing of his Humans and among themselves they help each other a lot, which for me is the basis of the success of the company’s growth. I really hope they have learned as much as I did. For several months I delivered to my thesis director about 8 different projects that I had find interesting to work on the remote work (stress, social support, culture differences, coping strategies, communication, isolation, identity…) all of them without success. My director disapproved each one of them as remote work in general is too extensive and scattered for a master thesis and I had to focus on a smaller group. As I was doing my internship at Human Made, I thought it was a good idea to focus my study on the same subject but only within the WordPress community. It was perfect since there have been no studies in this field in the WordPress community! Since WordPress project volunteers are the driving force behind the project, it has become particularly important to focus more on their psychological well-being. I sent the new thesis project about the role of motivation on burnout into the WordPress Community to my director and my research protocol was finally approved! WordPress is a community I’ve known for years thanks to my husband and I got closer to it with the time. My first contribution was to the Polyglots Team, he taught me how to start contributing and translating. He motivated me to give talks in WordCamps, something that I was very afraid of but I took it as an opportunity to share what I have learned about stress. I end up contributing with a couple of talks in WordCamp Sevilla and Barcelona about stress and remote work. Recently, I volunteered at past WordCamp Europe 2017. 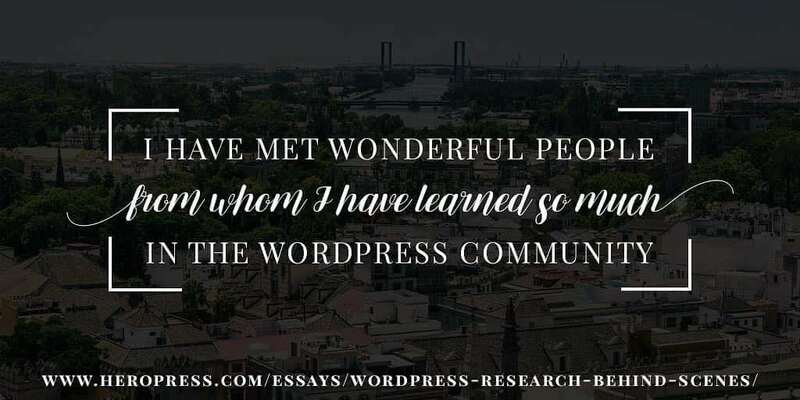 I have met wonderful people from whom I have learned so much in the WordPress community, I never thought that I would ended up being part of this community myself! So, in the end, for me it is more exciting to do my research on the WordPress community because I have a lot of affection for it. And there are so many more things to investigate! My purpose is to contribute with this ecosystem improving its well-being. For the moment, I am working on the survey data of my current research and I am looking forward to sharing the results with the WordPress community! The post WordPress Research Behind The Scenes appeared first on HeroPress.